On July 22, 2011, Anders Behring Breivik detonated a bomb outside government buildings in central Oslo, killing eight people. He then proceeded to a youth camp on the island of Utøya, where he killed sixty-nine more, most of them teenage members of Norway’s governing Labour Party. 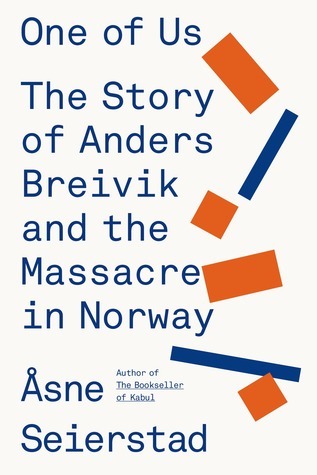 Journalist Åsne Seierstad tells the story of this terrible day and what led up to it. What made Breivik, a gifted child from an affluent neighborhood in Oslo, become a terrorist? One of Us is mostly a deep dive into the life of Breivik, and an investigation of what in his past could have possibly shaped him into a terrorist. With intricate detail, Seierstad maps his transformation from smart yet socially awkward teen to radicalized, misogynistic bigot. It’s disquieting to examine the mind of a killer, especially when there’s no clear, black-or-white answer to the why of his evil deeds. I appreciate that Seierstad dutifully and respectfully recounts the lives of several of the teenage victims as well. By the time you reach the chapter on the island massacre, you feel like you really know all these people. I’m unfamiliar with the Norwegian justice process, but I was shocked that Breivik received only 21 years, which is the maximum sentence allowed there. (It can be extended indefinitely.) He murdered 77 people in cold blood, injured hundreds more, and proudly proclaimed it in court. I admire Norway’s belief in and commitment to rehabilitation instead of permanent institutionalization, but it appears that Breivik won’t change for the better in prison. He’s recently popped up in the news claiming “inhumane conditions” and abuse by Norway while in prison, as well as for changing his name. In court appearances he shows zero remorse for his terrorist acts and murders, and frequently performs Nazi salutes. We are a small country, but we are a proud people. We are still shaken by what has happened to us, but we will never relinquish our values. Our answer is more democracy, more openness and more humanity. But never naivety. One of Us is a comprehensive journalistic achievement, bullet by sickening bullet, but reads like a novel. This is such a powerful, frightening, and important book. It’s difficult to get through some sections. I can only imagine the profound pain and anguish of the victims’ families. As an American, I’m furious and concerned about the lack of gun laws and regulations in my country, and how many lives are lost and destroyed by gun violence every day. It shouldn’t be this way, and it doesn’t have to be. This entry was posted in books and tagged crime, history, male adolescence, non-fiction, norway, politics, society, true crime, violence by kristin @ my little heart melodies. Bookmark the permalink.